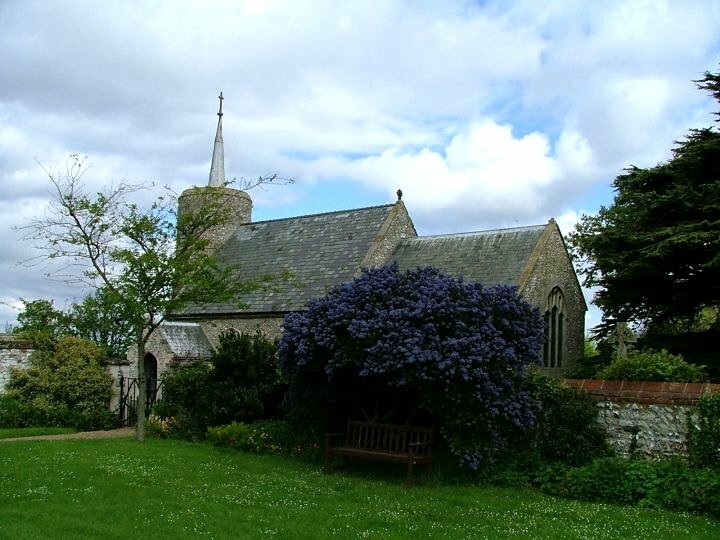 Unusually for this part of Norfolk, St Mary is small, but it is as pretty as many of the rest. The village name rather suits it, actually. The prettiness of the tower is enhanced by a rarity, the little medieval lead and wood spire. This is just part of the late 15th century going over here; they resisted the temptation to make it bigger, which must have taken some resolve with all that wool money burning holes in their pockets, and simply beautified it, with elegant windows and a pretty screen. The porch is Victorian, though, and I suspect their hand in the rather elaborate Norman west window. Opening the door was enough to fill the little nave with light. In common with many otther churches around here, St Mary has a Norman tub font. It is a bit weathered, because it spent several centuries in the churchyard being used as a horse trough. The elegant 18th century font in the sanctuary served its purpose at the time,as it had also done at nearby Burnham Deepdale during that church's famous font's sojourn in a rectory garden. The 19th century glass here is good and bad. Best of all is in the west window, a sower going forth to sow, but I was also very fond of the Annunciation and Nativity in a north side window. The screen is tiny, but still manages 12 elegant panels. There are no figures on them, but one curious survival is a quatrefoil squint hole, bored on the south side. In the chancel, curious remains of the original church can be spotted peeping through the plaster, like bones of an ancient creature.